PRIME Minister Tun Dr Mahathir Mohamad treaded carefully in regional waters on his first official visit to the Philippines, which concluded on Friday. A week before Dr Mahathir’s arrival on Wednesday, the multi-nation (including Malaysia, the Philippines and China) territorial dispute over the Spratlys archipelago had gained more momentum. A daily newspaper, Philippine Star, had reported that United States Secretary of State Mike Pompeo, who had met with Philippine President Rodrigo Duterte last week, said Washington would protect Manila if its forces were attacked in the South China Sea. China subsequently responded by downplaying such strong words of caution. Its ambassador to the Philippines reportedly gave an assurance that China was committed to work on the Code of Conduct with Asean countries to ensure stability in the South China Sea and the rest of the region. Such a delicate matter required delicate treatment. The 94-year- old statesman, who returned as Malaysia’s seventh prime minister last year, approached the matter with strategic restraint. After addressing the business community at the Malaysia-Philippine business forum on Thursday, Dr Mahathir was asked about his view on the thorny issue and the role of Asean in the face of geopolitical headwinds. Dr Mahathir later quoted Greek historian and Athenian general Thucydides — “the powerful will take what they want, the weak will yield what they must” — to drive his point home. The weak, Dr Mahathir said, must learn how to live with the strong while employing the best out of their weaknesses. “By coming together, we strengthen ourselves. But it should not lead to confrontations. We should always keep a diplomatic level where things are settled through negotiations, arbitrations, or the court of law. “In yielding also, we must find instances where we can gain some advantages,” he said to thunderous applause from the audience. For Malaysia, Dr Mahathir’s visit couldn’t have come at a better time. As Malaysia has played a key role as third party facilitator in the Mindanao peace process that led to the formation of Bangsamoro Autonomous Region Muslim Mindanao, the recently ratified Bangsamoro Organic Law that granted automomy to the people in the region has pressed a call for further assistance from its Muslim brothers. This call was heard by Malaysia loud and clear. In Manila during the visit, Dr Mahathir expressed Malaysia’s continued commitment to development initiatives in the Bangsamoro region. Duterte later responded by thanking him for Malaysia’s “unrelenting support”. “Certainly, there are still many challenges ahead. But positive transformation would not continue to happen had (the) wheels not been pushed and made to run back then. And in this, the prime minister (Dr Mahathir) has been a key figure,” Duterte had said during his joint statement with Dr Mahathir at the Malacanang Palace where Dr Mahathir was given an official welcome. The visit also reinforced the diplomatic bridges that were formed with Manila 60 years ago, with a renewed commitment to brotherhood. “(And) I believe there is no better time than now to acknowledge him as a friend, partner and brother,” Duterte said at Malacanang Palace, as reported by Philippine Star, adding that he acknowledged Dr Mahathir’s advocacy for peace, regional cooperation and adherence to international law “guided by sovereign aspirations and unfettered by external dictates”. Dr Mahathir’s visit also signalled a future of closer cooperation between the two countries in regional security and bilateral trade, and for the newly-minted autonomous region in Muslim Mindanao, an impetus for socio-eonomic growth. Wrapping up his visit, themed, “Partners for Progress, Brothers for Peace”, Dr Mahathir told the media before his departure home on Friday that the visit was “very successful” and he regarded Duterte as “a very good host”. “We see that the future must continue with the involvement of Malaysia in the south (of the Philippines), because the people in the south look up to us as a (role) model. We can learn from each other. 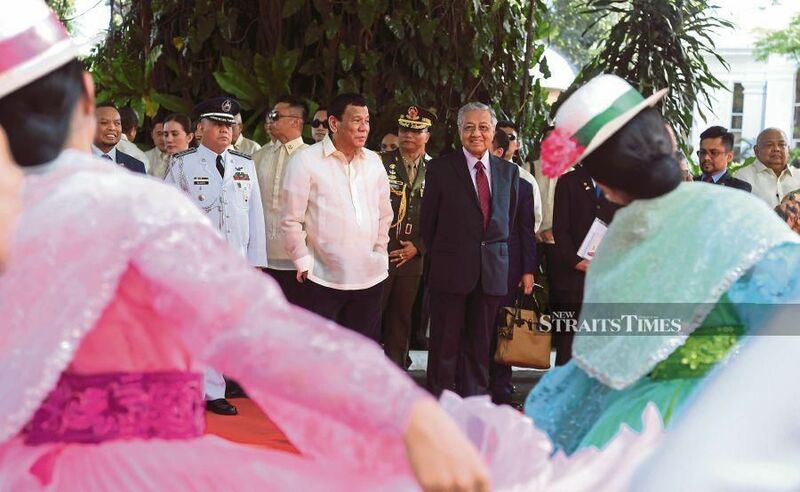 “There are things in the Philippines we can learn from and there are things in Malaysia which would be useful to be adopted here,” said Dr Mahathir, who was given the highest state honour on Thursday to lay the wreath to commemorate the nation’s hero, Dr Jose Rizal, at the Rizal Monument. The award-winning writer is a Chevening award recipient and NST scholar who has been with the newspaper, covering a wide range of issues and subjects, for 24 years.